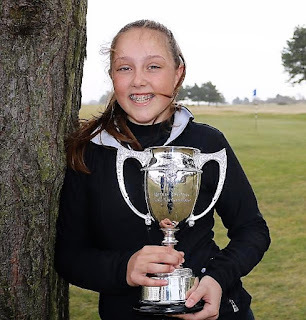 Top Welsh teenage prospect Ffion Tynan, a member at Minchinhampton Golf Club and a GB and I Junior Vagliano Trophy team player, won the Scottish Girls Open championship by two strokes at Monifieth Links today. She also finished the leading Under-16 years player. Ffion's final round of five birdies also included a double bogey 6 at the 15th but her scores of 74, 72 and 72 for one-under-par aggregate of 218 over a par 73 women's course saw her run out a comfortable from two English players who were ahead of her at the start of the last day. Rosie Belsham (Whitley Bay) and Natasha Slater (Ulverston) shared second place on 220. Rosie had scores of 72, 73 and 75, Natasha 73, 72 and 75. The highest placed Scot was Carmen Griffiths (Aboyne) who had rounds of 80, 69 and 78 for sixth place on 227. She was the fourth best U16 player and had two birdies, seven bogeys in her final round. 218 F Tynan (Minchinhampton) 74 72 72. 226 E Lewis (Knowle) 80 70 76. 227 C Griffiths (Aboyne) 80 69 78. 229 H C Getsdottir (Ice) 83 74 73, K Sibley (Carlisle) 78 78 74, C Neilson (Alvaneu Bad) 77 75 78. 231 H Darling (Broomieknowe) 81 75 75, L Duncan (West Kilbride) 80 76 75, L McClymont (Milngavie) 77 74 80, K Brodie (Strathmore) 77 72 82 (T13).